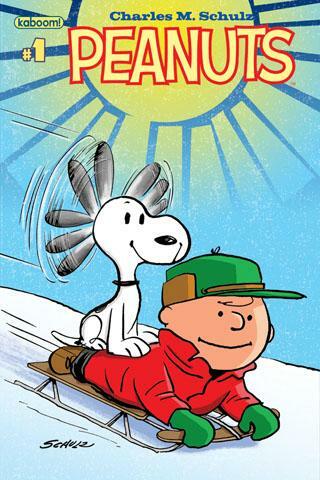 Peanuts #1, the first monthly release of the new Peanuts comic book, arrives in stores today, Wednesday, January 4. Like the Peanuts #0 preview issue, this $3.99 comic blends new stories featuring the Peanuts gang (yes, drawn and written by artists other than Charles Schulz) with reprints of classic Peanuts Sunday strips. You can see a 5-page preview of Peanuts #1 at Comic Book Resources. Your local comic book store is the best place to get each issue, but if that's not an option, you can order it directly from the publisher, Boom Studios — but do note that shipping for one comic costs as much as the comic book itself! Boom Studios also offers a "variant" cover edition of Peanuts #1, featuring a vintage 1950 Schulz drawing of Charlie Brown on a yellow background. But quantities of the variant cover edition are deliberately very limited, so your comic book store may not have one — and even if they do, it likely will be quite a bit more expensive than the regular cover version. For example, Boom Studios lists the variant cover edition on its website at a cost of $19.99! We think most folks will be happy with the regular cover version and don't need to spend money on deliberately scarce "collectible" versions of the comic. Although this new Peanuts series is advertised as being monthly, that's not entirely true; the comic books will be published as a series of four issues over four months, followed by a break of a few months, and then another set of four, and so on. (So, Peanuts #2-#4 will follow from February through April, followed by a pause.) After each set of four comics is published, they'll subsequently be collected into a trade paperback edition. The first trade paperback, which will collect Peanuts #1-4 and presumably the special preview issue Peanuts #0, is due out in August and can be pre-ordered from Amazon. We've no information at this time regarding the possibility of bonus material in the trade editions. So, if you want to experience the pleasure of getting a new Peanuts comic each month, now's the time to head out and get Peanuts #1! What happened to "My family does not wish anyone else to continue Peanuts"? From the previews I've seen, these comic books have all the quality of the older Dell/TipTom comics (that is not a compliment). If you really appreciate Schulz' work, I don't think you will appreciate these. Actually, Schulz's statement was that he didn't want anyone else to draw or continue the daily newspaper comic strip after he passed away. These are new comic books, not new comic strips for the newspaper, so they don't violate the letter of his wishes. And as you mention, there is already a precedent for non-Schulz Peanuts comic books; the 1950's and 1960's Peanuts comic books that featured stories and art that written and drawn by other artists, done with Schulz's permission. The new Peanuts comic books may not be to everyone's liking, but they have received a variety of positive reviews as well. Like the animated television shows, it's a different way for folks to experience Peanuts - and anyone who is curious should probably check out a full issue to see what they think.